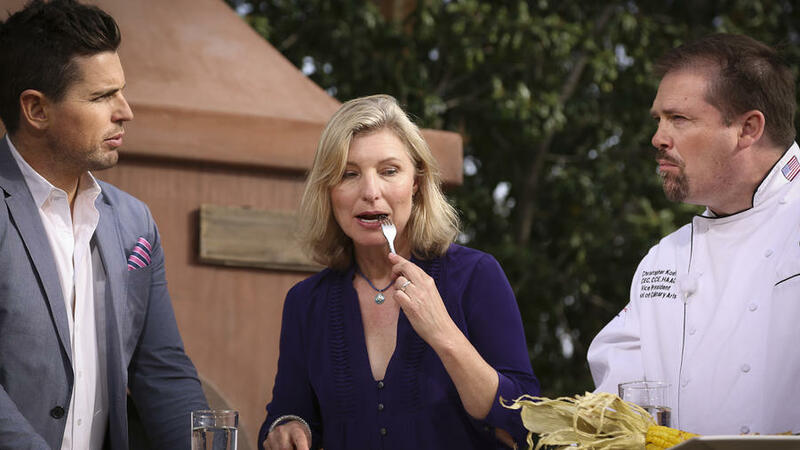 Sunset's Own Margo True Judges the "Home Chef Showdown"
Total tasting concentration during Episode 2, with host Ryan Scott (left) and my fellow judge Chris Koetke. Should this dish win? Why—or why not? As a TV judge on “Home Chef Showdown,” airing June 22 to 24 on the Live Well Network, I had to be discriminating, but nice. Hmmmm. Should this dish win? Why—or why not? As a TV judge on “Home Chef Showdown,” airing June 22 to 24 on the Live Well Network, I had to be discriminating, but nice. No problem! I love constructive criticism. It’s what we food editors do every day in the Sunset Test Kitchen when we try each other’s creations. Only this time, it was in front of a crew of 21 and about a dozen cameras. You wouldn’t believe the crazy moments that occurred, for real, during the filming of these three episodes. (Shooting flames played a small part.) If you tune in, please know that none of it was made up. Including the location—all the filming was done here at Sunset. The details: June 22 at 8p/7c (Appetizers), June 23 at 8:30p/7:30c (Summer Meal) and June 24 at 8:30p/7:30c (Desserts). Don’t worry if you miss it the first go-round: Each episode will air 20 times. For a list of where you can watch, go to http://livewellnetwork.com/feature/9291108.